I have enjoyed ice cream from Cairo to Kauai. Thailand to Tanzania. It's true - not just fun alliteration. Every where I go, stopping for ice cream is on my agenda. This past weekend I tried Lemon Meringue Pie ice cream for the first time at Aloha Ice Cream in South Lake Tahoe. Last month it was Lemongrass ice cream at DeLise in San Francisco. My mom, knowing my love of ice cream, gave me an ice cream maker a few years ago. I do not use it as often as I should. This was my inaugural recipe of 2012. Here's to a delicious summer! Whisk egg yolk until slightly thickened (I did this in the liquid measuring cup I used for the milk and cream...why dirty another dish?) Gradually whisk about 1 cup hot cream mixture into yolk. Add yolk mixture to remaining cream mixture, whisking constantly. That liquid measuring cup made it very easy and clean. Pour mixture through a fine wire-mesh strainer into a bowl, discarding solids. Of course my strainer is almost as tiny as the key limes. Cool 1 hour, stirring occasionally. Place plastic wrap directly on cream mixture; chill 8 to 24 hours. Pour mixture into freezer container of a 1 1/2-qt. electric ice-cream maker, and freeze according to manufacturer's instructions. For my Cuisinart ice cream maker it was 20-30 minutes. I opted for 30. Stir in Key lime zest, Key lime juice, and crushed graham crackers halfway through freezing. Let stand at room temperature 5 to 10 minutes before serving. I haven't used my ice cream maker all that much. I was really impressed with how thick and "fluffy", for lack of a better word, the ice cream was when it was finished. 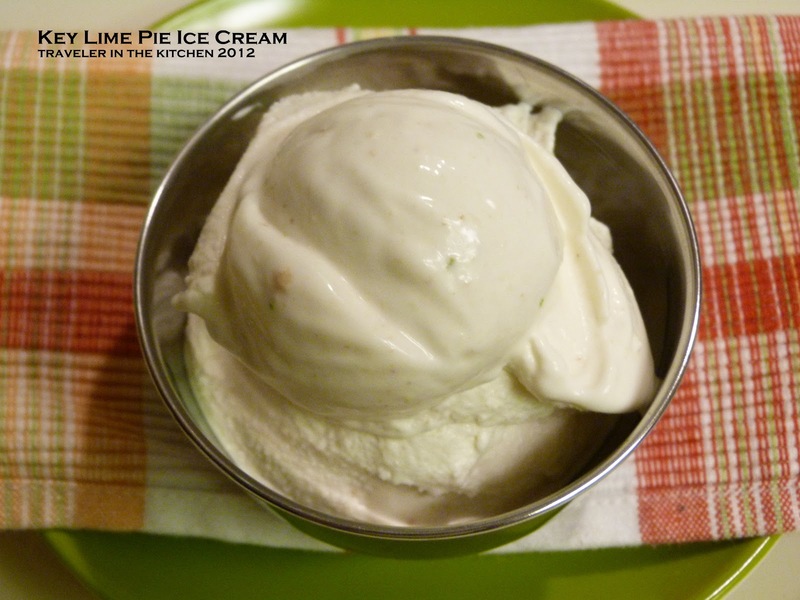 Key lime juice and lime juice do not make the ice cream green. If you really wanted green ice cream you need to add food coloring - but why?